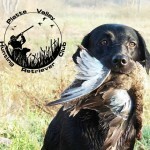 The Started Hunting Retriever Test is for young or inexperienced hunting retrievers. The Started Hunting Retriever might not have had the experience of a season of hunting, or limited exposure to hunting and/or training. 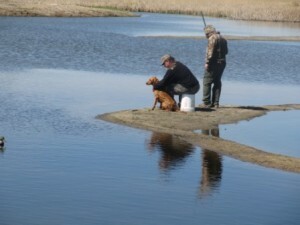 A Started Hunting Retriever should be able to do a simple dove or waterfowl hunt and retrieve game from land and water. The dog doesn’t need to be steady and may be gently restrained by leash or collar at the line and should be brought to and from the line on leash. Retrieves will be only marks and only singles. The singles may be back to back, i.e. one single is retrieved, then another single is given from the same point of origin with the bird in a different direction. The dog should have been introduced to gunfire before entering a Started test. But, you may ask that the gun step a way just a bit. There will be a shot at the top of the arc when the bird is thrown, and there will be either a duck call or attention getting shot from where the bird is thrown. The dog is not required to deliver to hand, but close to the point of origin. The judge will tell you how close is required. In a licensed hunt, all birds will be dead, unless there is a shot flyer, which is not used in Started. Normally there will be 4 singles, two each on land and water. Typically there are two series of back‑to‑back singles. Maximum distance for marks is 75 yards for land retrieves and 60 yards for water retrieves. Dog can be cast twice from the line. Dogs are not expected to take hand signals, but handling on a mark is acceptable (In even seasoned and finished stakes, a clean handle is preferable to an extended hunt if the dog is in trouble.) A dog may be recast from the line for a bird, though what occurred before the recast is still considered in the judging.